I hope you're enjoying your first weekend of the New Year 2018! Today I have a special surprise or you. In today's Story Time With God Episode 80, learn why you should check yourself before you react to situations, circumstances, and also to other people. We are all human and sometimes we say things before we have a chance to think things through. Words are powerful and they can hurt the people we love and care for very much. They can break bonds and sever ties professionally. So before you jump off into the deep end of your emotions, stop, and take a step back and reassess the situation. Once the damage has been done, sometimes it's difficult to rekindle what was lost. We will be reading about Lamech on this first Sunday in the daily devotional for 2018 called The One Year: Life Lessons from The Bible. Lamesh was quick to kill a young child who striked him. He was not apologetic by any means and didn't care for divine discipline from God. Today, you will learn that we must always keep ourselves in check with God so that we do not become like Lamech. We will also learn that sin is like a weed. If it is not pulled, it will fester and continue to grow, sprouting bad character, bad decisions, and negative reactions on our part that is not of God. Presenting yourself in a positive way is not only good for others but for you as well. When you feel good about yourself and the person that you are presenting to the world, you automatically receive good vibes in return. 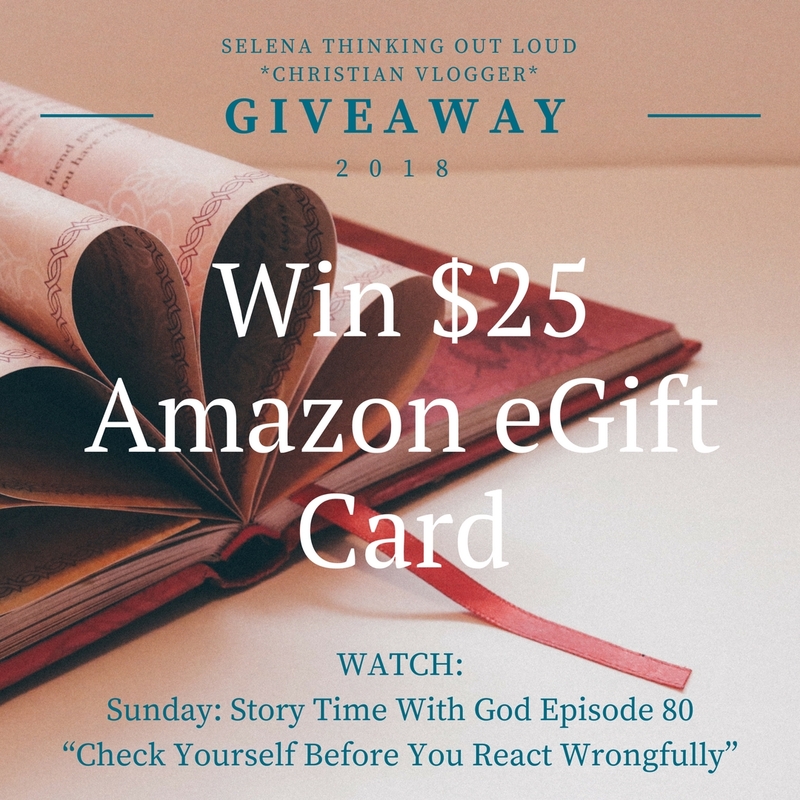 Watch this week's Sunday: Story Time With God, Episode 80 and enter the Giveaway below for a Chance to Win a $25 Amazon eGift Card for whatever you would like. I hope you purchase some materials that will help you to continue your relationship with God but that's up to you. Thank you for watching and participating in my giveaway. All of the information on the Giveaway is below. The following Bible scripture will show you specifically where Lamech is mentioned in the Bible and more information about him. Disclaimer: Selena Thinking Out Loud is hosting this giveaway. The winner will be chosen using the random tool inside of the Rafflecopter Entry Form. No other entries will be accepted outside of the Rafflecopter Entry Form. All entries are optional. Amazon.com, Facebook, Twitter, Instagram, or any other social networking sites mentioned are sponsoring this event. The winner will be notified via email after verification of entry. The Amazon eGift Card will be delivered to the winner's email address they confirm. If an international winner is chosen and they do not have access to Amazon shipments, they will be sent their prize via PayPal. No purchase necessary. If you would like to host a giveaway with this blog, contact me for details. I would ask him for good health for my loved ones. To keep my family healthy and not let any harm come to them. I want my family and friends to be happy and healthy. I ask to keep our family healthy. Please look over me and my twins while I start this new chapter in my life. I would ask God to keep my family healthy and happy. If I could ask God to do only one thing in my life, it would be to grow closer to Him during the coming year. In fact, this is my prayer — and I hope it’s your prayer, as well.When we aren’t close to God, it means we are separated from Him and have turned our backs on His plan for our lives. The one thing I would ask for from God is continued good health. I would ask for everyone in my family to be in great health! I would like to ask God for better health for my family this year. I would ask God a lot of why and hows. Ask for good health and help for those in need! I would ask God to keep my Mom and brother healthy. I would ask God to keep people who love me healthy. I would ask God to please keep my family and loved ones happy and healthy. I would ask him to cure my Mom of her sickness. Also, if I can ask him something else, then I would ask him for a new President. That me and my spouse will not believe in any falsehoods and we would both always seek him. if i could ask one thing from god it would be to rid me of this horrible Rheumatoid Arthritis and let me be my old self ! i can only pray ! To keep my children happy and healthy. I would ask him to protect my loved ones. I would ask for good health and happiness for my family and I.
healing from the constant pain in my body. I would ask God for family members to love each other. If I could ask one thing from God it would be to bring my family closer. Thanks for the giveaway! I would ask for good health for me and my family. I would ask for him to help repair the broken the relationship with my immediate family. I would ask for health! I've struggled with one thing and another and it seems everytime I overcome something, something else happens. I would ask for Peace on Earth. To keep everyone in my family healthy & blessed! Great question. I ask that he continue to keep my family safe and healthy this year. I would ask for better health in 2018. I would ask for good health for my family. Restore my sister to perfect health. I would ask that my family and friends to be happy and healthy. I would ask for Godly wisdom. I would ask for health and happiness for us! Health for my family and healing for those that need it. I would ask God for keeping my family healthy and safe. I just want good health for me and all my loved ones. Please help me find my son a wife. I would ask God to help my Mom to not be in so much pain. To keep my family happy and healty and to be given the miracle of a baby so I can see my husband hold his child for the first time. I'd ask for my family members that are struggling with addiction to put those habits away forever and replace those habits with healthy new habits to continue on with productive lives! Also, for us to have what we need. I would ask for health and happiness for my family. I would also ask him for guidance while we decide about building a home. I would ask God to keep us healthy and ask for a financial blessing. The one thing that I would ask for is good health because without it, you are in big trouble.